Here is everything you need to know about diagramming phrases. Yippee! Phrases are groups of words without both a subject and a verb, functioning as a single part of speech. Would you like to have all of these diagrams at your fingertips? Okay, it's time to learn about diagramming phrases! Prepositional phrases begin with a preposition and end with a noun or a pronoun. The noun or pronoun at the end of the phrase is called the object of the preposition. Prepositional phrases act as either adjectives or adverbs. David pointed at Kyle's bowling ball. The painting over the television is my favorite. 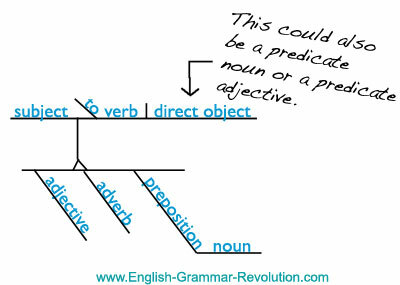 When we diagram them, it's easy to see that prepositional phrases act as adjectives or adverbs because they are connected to the main diagram with a diagonal line starting from the word that they are modifying. This is very similar to how we diagram adjectives and adverbs! Gerunds are formed from verbs and function as nouns. They take the form of verb + -ing. 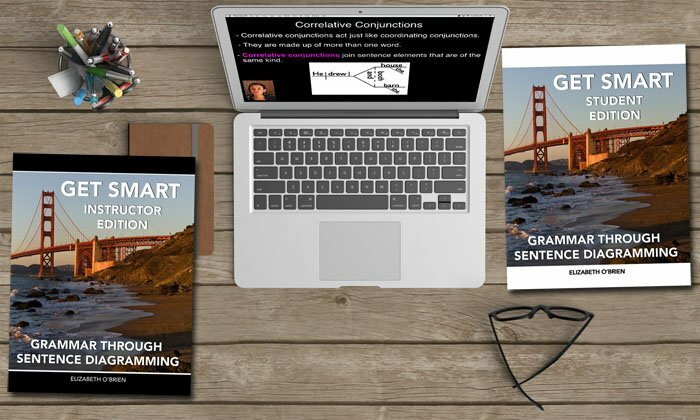 Gerund phrases consist of a gerund and all of the gerund's complements and modifiers. Gerund phrases act as nouns. That means that they can perform any of the noun jobs. These examples show gerund phrases functioning as subjects. Reading on the porch is fun. Diagram gerunds on steps. Put the verb part of the gerund on the top part of the step and the -ing part of the gerund on the bottom part of the step. This example shows a gerund phrase acting as the subject of a sentence, but the same structure is used when the gerund phrase is performing any of the other noun jobs. Participles are formed from verbs and act as adjectives. Participial phrases consist of a participle and the participle's complements and modifiers. Participial phrases act as adjectives. 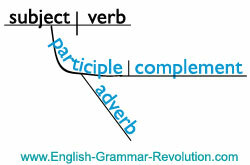 Diagram the participle on a curved, slanted line below the word that it modifies. Diagram its complements and modifiers just as you normally would. This example shows a participial phrase with a direct object and an adverb, but participial phrases can also contain predicate nouns, predicate adjectives, adjectives, and other phrases. You'll see more examples of this in the Sentence Diagramming Reference Manual. Infinitives are formed from verbs and act as nouns, adjectives, or adverbs. They take the form of to + verb. Infinitive phrases consist of an infinitive and all of the infinitive's complements and modifiers. The whole phrase acts as a noun, adjective, or adverb. I love to run marathons. Jack waited to eat the cupcake. 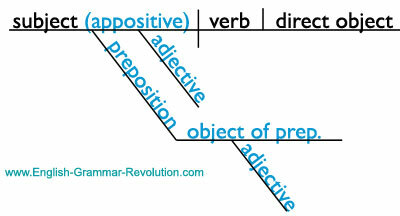 This sentence diagram below shows the basic form of an infinitive phrase. Based on how the infinitive is acting (noun, adjective, or adverb), put this little tree in the right space within the sentence diagram. Appositives are nouns that rename other nouns. Appositive phrases consist of an appositive and the appositive's modifiers. Mike and Bri graduated from UWEC, my alma mater. Esther, my sister with dark hair, sang a song. The whole phrase acts as a noun. The appositive itself goes in parentheses next to the noun that it is renaming. Diagram any modifiers below the appositive. Verb phrases consist of one or more helping verbs and a main verb. The whole phrase functions as a verb. Have you been sitting in my chair? Diagram verb phrases the same way that you diagram regular verbs. Put the helping verb(s) and the main verb next to each other on the horizontal line to the right of the subject. How did that go? Do you like diagramming phrases? I hope so!